Click here to go to our Connector care page - mandatory reading! 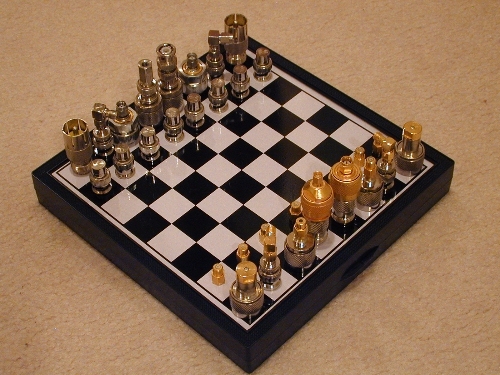 Chess-set photo courtesy of TVB of leapsecond.com! Attention everyone: we recommend that you use our section on connector care as a mandatory reading assignment before any of your new hires are even allowed in your laboratory! Check out our connector care poster in our download area! Microwave coaxial connectors are now a multibillion-dollar-per-year industry. There are a wide variety of microwave coaxial connector families and more choices are added each year. Microwave coaxial connectors are used to make low VSWR coaxial connections, and can be used as the terminations ("ends") of coaxial cables, installed into housings, and increasingly onto circuit cards. 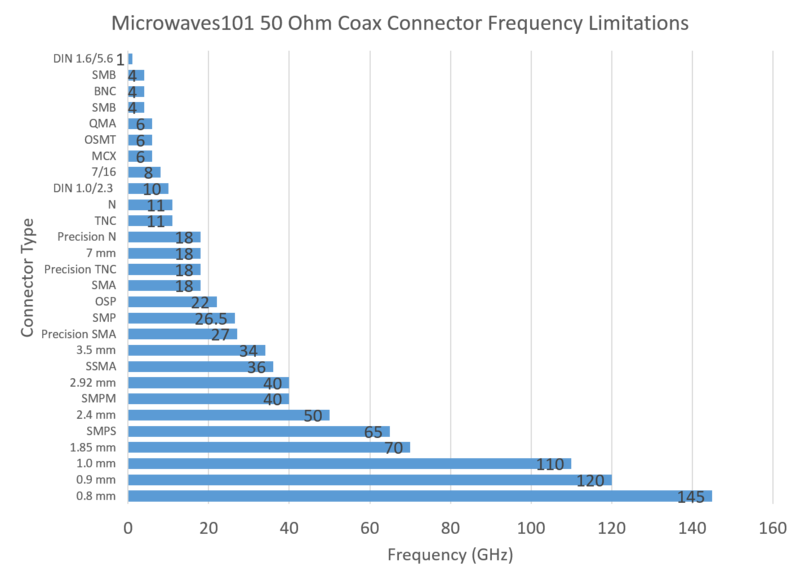 Most microwave systems use a 50 ohm characteristic impedance but some use 75 ohms (BEWARE! Some connector families, such as type N, come in both 50 ohms and 75 ohms. Don't mix these up!) All connector families described on this page are 50 ohms unless otherwise noted. See the equation for the characteristic impedance of coax at coaxial transmission lines, or go straight to the coax calculator. The term "elbow" is another bit of connector slang, it means a right-angle bend connector or adapter. Right-angle connectors come in two types: 90 degree, and swept (see photo below). In general, the swept connectors are better at high frequencies, and the outer jackets are molded rather than machined. If you took apart a 90 degree elbow you'd see why. It's because the dielectric typically is not continuous at the 90 degree junction, so there is some parasitic inductance there that screws up the VSWR. If you took apart the swept elbow connector you would find that the dielectric inside is continuous between the two ends. We don’t think much about it but it’s kind of amazing that you can buy these inexpensive and precise little microwave parts, one device at one place and another device at another place, and they actually fit together and perform well. The secret is standardization. There are US standards and European standards, commercial standards and military standards, and broadcast standards and proprietary standards. If you really want to know the nitty-gritty stuff about common connectors – a great textbook for you is the US specification: MIL-PRF-39012F (coaxial cable connectors) or MIL-DTL-83517B (transmission line device connectors.) It’s about 40 pages long and has generic information on the design requirements for connectors and includes references for the types and quality of materials to be used and the performance tests that have to be met and the test equipment configurations to do the tests. To get to specific information on a particular connector type, you need to go to MIL-PRF-39012F Supplement 1 to find the detailed specification sheet for that connector (eg MIL-DTL-83517/1B is the detailed specification page for a flange mounted SMA connector that interfaces to a microstrip line.) But wait, there’s more! MIL-STD-348B has mechanical drawings for each of the different types of connectors that are used in the US military and they are all fully dimensioned with tolerances. It’s 223 pages in length and includes over 62 connector configurations. The cutoff frequency is a key property of any coax transmission line above which the desired TEM mode will no longer be the only mode that propagates (see transmission lines for a discussion of cutoff frequency, or go straight to the coax calculator. Don't use coaxial connectors or transmission lines above their cutoff frequencies. The industry-accepted frequency limits of connectors families are generally 90% of their theoretical cutoff frequency. Read about Rule of Thumb #117 here, where we calculated the cutoffs for all of the popular precision air coax families. The following table lists all of the major connector families. Generally, cost increases proportionately with frequency limit. And "air" costs a lot more than "PTFE", which may seem counterintuitive, until you see how the center conductor has to be supported in an air-dielectric connector. Some connector history is included in the right-hand column. DIN 1.6/5.6 1 GHz PTFE Introduced by the European telecommunications market in the 1990 75 ohms with push-pull coupling and threaded coupling. BNC 4 GHz PTFE "Bayonet type-N connector", or "Bayonet Neill-Concelman" according to Johnson Components. Developed in the early 1950s at Bell Labs. Could also stand for "baby N connector". SMB 4 GHz PTFE "Sub-miniature type B", a snap-on subminiature connector, available in 50 and 75 ohms. OSX, MCX, PCX 6 GHz PTFE MCX was the original name of the Snap-On"micro-coax" connector species. Available in 50 and 75 ohms. MMCX 6 GHz PTFE Micro-miniature coax connector, popular in the wire industry because its small size and cheap price. DIN 1.0/2.3 10 GHz PTFE Introduced by the European telecommunications market in the 1990, available in both 50 ohms and 75 ohms with push-pull coupling. SMC 10 GHz PTFE Sub-miniature type C, a threaded subminiature connector, not widely used. SMA 25 GHz PTFE Sub-miniature type A developed in the 1960s, perhaps the most widely-used microwave connector system in the universe. TNC 15 GHz PTFE "Threaded Neill-Concelman" connector, according to Johnson Components, it is actually a threaded BNC connector, to reduce vibration problems. Carl Concelman was an engineer at Amphenol. PTFE Named for Paul Neill of Bell Labs in the 1940s, available in 50 and 75 ohms. Cheap and rugged, it is still widely in use. Originally was usable up to one GHz, but over the years this species has been extended to 18 GHz, including work by Julius Botka at Hewlett Packard. APC-7, 7 mm 18 GHz PTFE APC-7 stands for "Amphenol precision connector", 7mm. Developed in the swinging 60s, ironically a truly sexless connector, which provides the lowest VSWR of any connector up to 18 GHz. OSP 22 GHz PTFE OSP stands for "Omni-Spectra push-on", a blind-mate connector with zero detent. Often used in equipment racks. 3.5 mm 26.5 GHz Air A precision (expensive) connector, it mates to cheaper SMA connectors. OSSP 28 GHz PTFE OSP stands for "Omni-Spectra subminiature push-on", a smaller version of OSP connector. SSMA 38 GHz PTFE Smaller than an SMA. 2.92 mm 40 GHz Air Precision connector, developed by Mario Maury in 1974. 2.92 mm will thread to cheaper SMA and 3.5 mm connectors. Often called "2.9 mm". K 40 GHz Air The original mass-marketed 2.92 mm connector, made by Wiltron (now Anritsu). Named the "K" connector, meaning it covers all of the K frequency bands. GPO, OSMP, SMP 40 GHz PTFE "Gilbert push-on", "Omni-spectra microminiature push-on"
OS-50P 40 GHz Smaller version of OSP blind-mate connector. 2.4 mm 50 GHz Air 2.4 mm, and 1.85 mm will mate with each other without damage. Developed by Julius Botka and Paul Watson in 1986, along with the 1.85 mm connector. 1.85 mm 60 GHz Air Mechanically compatible with 2.4 mm connectors. V 60 GHz Air Anritsu's term for 1.85 mm connectors because they span the V frequency band. 1 mm 110 GHz Air The Rolls Royce of connectors. This connector family works up to 110 GHz. It costs a fortune! Developed at Hewlett Packard (now Agilent) by Paul Watson in 1989. These are cheap and rugged, for these reasons you will find them used everywhere, all over your laboratory. Within any connector family with male and female interfaces, there are three adapters to use to change the interface. 1. A male-to-male adapter refers to an adapter with two male ends. This is often referred to as a "barrel" adapter. 2. A female-to-female adapter has two female ends; it is often referred to as a "bullet" adapter. 3. An adapter with one male end and one female end is often referred to as a "connector saver". This type of adapter is often screwed onto an expensive piece of test equipment or component that requires a lot of connect/disconnect cycles. If an incident occurs where one of the connectors is damaged, it is far cheaper to throw away and replace the connector saver than to repair expensive equipment that it is protecting. Below is a picture of an SMA connector saver, barrel and bullet adapter. This is why connector catalogs are so thick. Of course, there are some extreme permutations that would have a limited market, so they are deleted from the lineup. For example, no one is going to buy a 1 mm to type BNC adapter. So what is the appropriate frequency range to use for an interconnect system consisting of a mixture of connection families, where one family interfaces with another? You should not exceed the lowest frequency limit of any of the families, i.e. if you are connecting 2.92 to 2.4 coax, don't try to take data above 40 GHz. What other ways can you get in trouble? How about mating a cheap SMA connector to an expensive 3.5 or 2.92mm connector. The tolerances are quite different. Here's a rule that was provided by The Professor! ...even though combinations like SMA and K connectors are thread-compatible, plugging the inner conductor pin of one into the inner conductor sleeve of the other can damage the sleeve in the receptacle (jack/female) due to differences in the diameter tolerances. The rule I use to avoid that is, OK to plug a K plug/male into an SMA jack, not OK to put an SMA plug into a K jack. The jacks seem to be the more fragile side of the connection.